American and British politics are each characterised by a high degree of partisan rancour. But why is compromise now so difficult to achieve? In new research focussing on America which examines how people perceive politicians’ motives, David Doherty finds that factors such whether or not they agree with a representative’s position or their party affiliation can have a large influence. He writes that if people’s perceptions lead them to conclude that politicians are acting in bad faith, despite them agreeing on policy positions, then this will make political compromises even more difficult. The contemporary American political landscape is characterised by extreme levels of partisan acrimony. Some of this is undoubtedly tied to sizable differences between the policy goals of Democrats and Republicans. However, in new research I find evidence that an additional and perhaps more troubling psychological dynamic seems to also be at work. People appear to not only dislike the substance of political opponents’ positions; they also infer that these positions are being adopted for the “wrong reasons.” Similarly, not only do people tend to rate members of the opposing party less favorably than co-partisans, they also see these out-partisans as driven by less savory motives than co-partisans—even when they adopt an identical policy position. These inferences about politicians’ motives may foster a self-reinforcing dynamic where people are increasingly unwilling to compromise with those “across the aisle” because they believe them to be acting in bad faith. I fielded two experimental designs to explore these dynamics. In each experiment participants were presented with a brief story about a representative who adopted a particular position on a policy (funding for either nuclear power plants or farm subsidies). In each case, the representative’s position—whether he supported or opposed the bill (and, thus, whether the respondent agreed or disagreed with his position)—was randomly assigned, as was his party affiliation. After reading the story participants were asked to rate how important they thought each of a series of 13 motives was in explaining the representative’s position on the bill. four items that capture judgments about the importance of policy motives associated with the representative’s personal preferences: his own feelings about the bill, his personal values, his own policy preferences, ideological reasons. I combined the measures into three scales: one that measures how much the respondent believed the representative’s position was driven by political self-interest, one that measures how much they attributed the behavior to the representatives’ desire to serve the public, and one that measures the extent to which the respondent saw the representative’s position as driven by his own policy preferences (Note: the findings I discuss below were similar when individual items, rather than these summary measures, were used). Figure 1 presents the average effects of the policy and party agreement experimental treatments across the two studies. The policy agreement effect is the effect of presenting respondents with a representative who shares their policy preferences, rather than one with whom they disagree (blue bars). 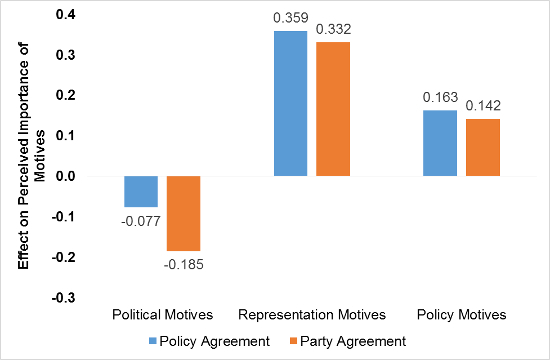 The figure shows that people saw a representative whose policy position they agreed with as only slightly less driven by political self-interest compared to a representative with whom they disagreed. In fact, this effect fell short of conventional levels of statistical significance in both studies. In contrast, people saw a representative whose position they agreed with as significantly more driven by both a desire to serve the public (representation motives) and their own principled policy preferences than a representative with whom they disagreed. The party agreement effects illustrated in Figure 1 are the effects of presenting partisan respondents with a representative who shares their party affiliation, rather than a representative from the opposing party (orange bars). The results are similar to those associated with policy agreement. Participants saw the position of a representative from their preferred party to be substantially more motivated by principled policy preferences and a desire to serve the public than a representative from the opposing party. The effect of partisan agreement on inferences about the extent to which the representative was driven by political self-interest is somewhat larger than the effect associated with policy agreement, but this effect only reached conventional levels of statistical significance in one of the two experiments. The findings regarding the effects of party agreement should be particularly troubling to those hoping for more cordial relations between Democrats and Republicans. Recall that the party affiliation and substantive policy position of the representative described in the experiment were each randomly assigned. Thus, the orange bars in Figure 1 indicate that people see representatives from the opposing party as substantially less interested in serving the public and less principled than representatives from their preferred party—even when they adopt substantively identical policy positions. I also explored whether people’s perceptions about a representative’s motives were associated with how they felt about the representative in general. At the end of each experiment respondents were asked to rate the job performance of the representative and how likely they would be to vote for the representative (each on a scale of 0-10). I averaged these two items into a single measure and estimated the relationship between each of the three motive attribution measures and this summary rating of the representative. Figure 2 reports the estimated change in the summary ratings associated with a moderate (two standard deviation) increase in the importance people assigned to each of the motives as explanations for the representative’s behavior. I benchmark these relationships to the direct effects of party and policy agreement on these summary ratings. Two findings are particularly notable. 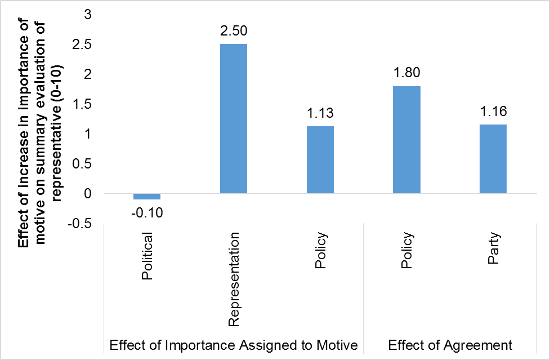 First, there is a clear and sizable relationship between the importance that people assign to the representation motives and policy motives measures, and their evaluation of the representative. The magnitudes of these relationships are comparable to those associated with the policy and party agreement treatments. Second, in spite of widespread complaints about politically motivated,excessively self-interested politicians, respondents who saw a representative’s position-taking as particularly self-interested did not evaluate them less favorably to any meaningful extent. This suggests that citizens may only be averse to political self-interest insofar as they see it as a signal that politicians’ desire to serve the public and act in a principled fashion are lacking. It’s important to note that these experiments do not provide a way to determine whether people’s inference about a representative’s motives affect how they evaluate that representative. They may, instead, reach a summary judgment of the representative which affects their perceptions of the representative’s motives. However, in either case, the dynamic is problematic. If inferences about a representative’s motives affect overall evaluations of that representative, this would suggest that inferences that political opponents are driven by unsavory motives can reinforce the growing political—and particularly partisan—antipathy found in the contemporary United States. If people, instead, reach summary judgments of a representative and use these to make inferences about that representative’s motives, these attributions may be used as a powerful means to justify their unfavorable summary assessments (e.g., “Of course I don’t like Representative X, his actions are clearly unprincipled and demonstrate a lack of desire to help the American people!”). In summary, the findings from these experiments illustrate how inferences about motives may foster the seemingly inexorable escalation of political conflict in the US. The findings presented in Figure 1 demonstrate that factors like whether people personally agree with the position a representative adopts and whether they share the representative’s party affiliation can affect their inferences about that representative’s motives. These motives may foster, or serve as justification for, unfavorable summary evaluations of political opponents. Ultimately, if people readily reach the conclusion that members of the opposing party are acting in bad faith—even when they agree with their substantive policy position—it is perhaps little wonder that policy compromises have become increasing difficult to reach. This article is based on the paper ‘Perceived Motives in the Political Arena’ in American Politics Research. Note: This article gives the views of the author, and not the position of Democratic Audit UK, nor of the London School of Economics. It originally appeared on USApp– American Politics and Policy. Please read our comments policy before commenting.